PARSIPPANY — It’s official! Freneau Road was given the honorary name of “Chief Marty Rosen Way” in a ceremony held on Sunday, June 17 2018, at the Parsippany Volunteer Ambulance Squad (PVAS) building, 397 Parsippany Road. The Parsippany Volunteer Ambulance Squad building sits on the corner of Parsippany Road and Freneau Road. Mayor Michael A. Soriano presided over the event, and unveiled the new street sign. “Today we celebrate the accomplishments of our beloved longest riding active Life Member and I humbly take the reigns as the ‘senior’ guy of the squad, big shoes to fill, I hope to be around for at least as long as Marty,” said Chief Chris Miller. Joining members of the Rosen family (Marlene Rosen, Marty’s beloved wife; Seth Rosen and his wife Lisa; Belinda and Matt; Ricky, Alex and Sam, Marty’s Grandchildren) for the ceremony were members of Parsippany Volunteer Ambulance Squad, Lake Parsippany Volunteer Fire Department District 3, Members of Rockaway Neck Volunteer Ambulance Squad, Par-Troy Emergency Medical Services, Mayor Michael Soriano, Parsippany-Troy Hills Council President Paul Carifi, Jr., Parsippany-Troy Hills Police Chief Andrew Miller, Parsippany Area Chamber of Commerce Executive Board Member Frank Cahill and Board Member Nicolas Limanov and area residents. “So how did it happen that we are all here today wanting to see a piece of metal with a man’s name on it?” said Seth Rosen. “I’ll tell you how it happened. It happened because a group of people who give their nights and weekends up to care for strangers made it happen. It happened because of what he stood for, what he meant to them; the men and women of this volunteer squad refused to let that inspiration fade. It happened through love. Not the love of his family. We stand here in awe of what is happening. We came along for the ride. This memorial was made possible by the love of the men and women of this building. It was made possible by a grateful town and a new mayor who understood the significance of a sign dedicated to a volunteer in a “me-first” world,” continued Seth. “I hope everyone that sees this sign, stops and thinks about the meaning of volunteerism. How it built this country, how it built this town. From the ambulance squads to the fire departments to the rescue recovery squad. This town was forged by men and women and the business owners who let them leave during the day to answer a siren, a call for help,” said Seth Rosen. Marty Rosen was a volunteer with the Parsippany Volunteer Ambulance Squad for 48 years and was still an active member when he unexpectedly passed away on June 3, 2017 at the age of 89. Mr. Rosen joined the squad in 1968, three days after the squad was called to his home, for an injury to his youngest son, and circled the neighborhood three times not being able to find the new address. Mr. Rosen came home after joining and told his wife “they will never not find us again.” Having accomplished what he set out to do, Marty stayed with the squad for the next 48 years helping others. Over that period of time he held every rank and office the squad had to offer except Chief. The squad awarded him that rank posthumously in January 2018. It is estimated Marty went on over 12,000 calls in his time with the squad. This included delivering two babies in the town. Marty was also squad liaison to the New Jersey First Aid Council District Six. Most current squad members who rose through the ranks were instructed how to do things “Marty’s way.” This became a rallying cry on how to get things done properly. When Marty passed away in June, the squad transported his casket to the cemetery in the ambulance for “one last ride.” The township also broadcast a final farewell over the police radio for all to hear. Not wanting to let go of a beloved member or lose his memory and what he meant to them, the squad petitioned the town for the street dedication. Mayor Soriano was instrumental in getting the job done. In addition to volunteering for 48 years on the PVAS, after retiring, Marty was a school crossing guard stationed at Parsippany High School. A decorated veteran of the Korean War, Marty was awarded the Purple Heart after being wounded in action in Korea during June of 1951. Marty also survived the battle at the Chosin Reservoir. Even though wounded in com-bat and suffering frostbite, Marty remained with the United States Marine Corp for the next 30 years. Again, when others would have left after doing what they had to do, he stayed. 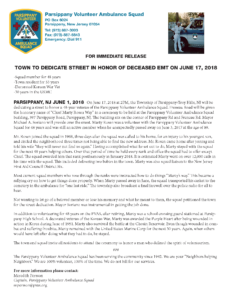 The town and squad invite all residents to attend the ceremony to honor a man who defined the spirit of volunteerism.